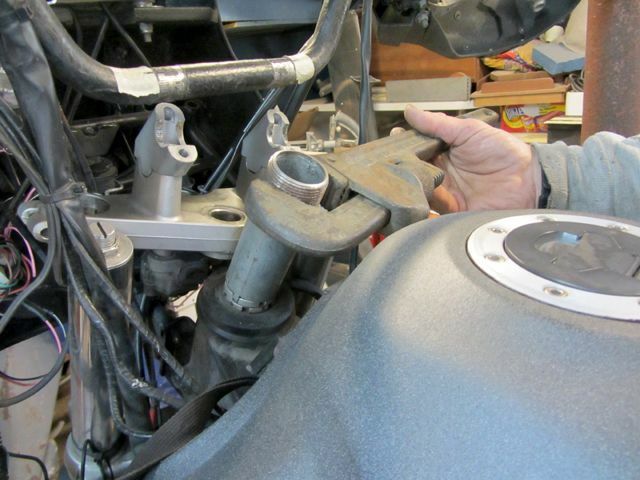 In late November 2009, I replaced and upgraded the steering stem bearings to my 2007, DL-650 V-Strom. The upgrade was from the stock bearings Suzuki installs, to a tapered roller bearing system. The article about the work that I did can be found HERE. Since then, part of my annual “Spring Maintenance Program”, before the riding season really kicks into gear, is to check and test, the steering bearings for proper adjustment. With these bearings adjusted properly, I have found that, the much talked about, “Deceleration Wobble” is eliminated. So is the “twitch” of the handlebars that can occur while riding rough roads at a spirited pace. (I have also upgraded my front and rear suspension systems. 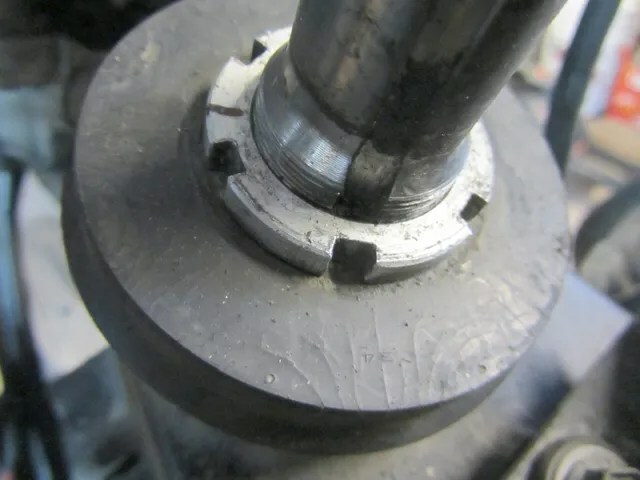 There is some “overlap” in correcting steering issues that occurs between the suspension system, and the steering stem bearings.). 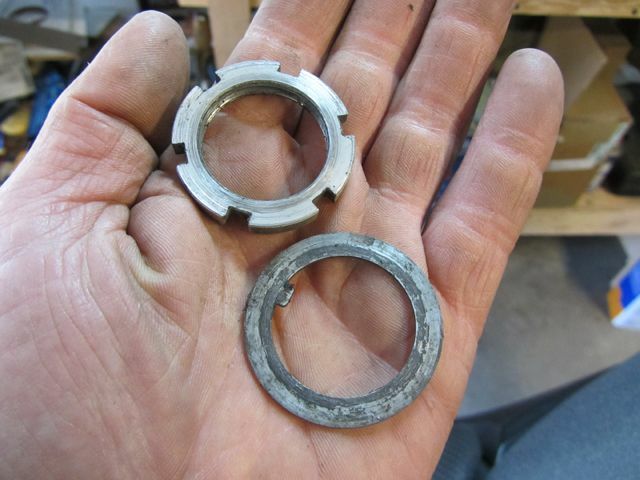 Towards the end of the 2011 riding season, I could tell that the stem bearings of my bike were due for an adjustment. However, that thought got swallowed up by my focus being turned to setting up my garage to build my Sonex airplane. 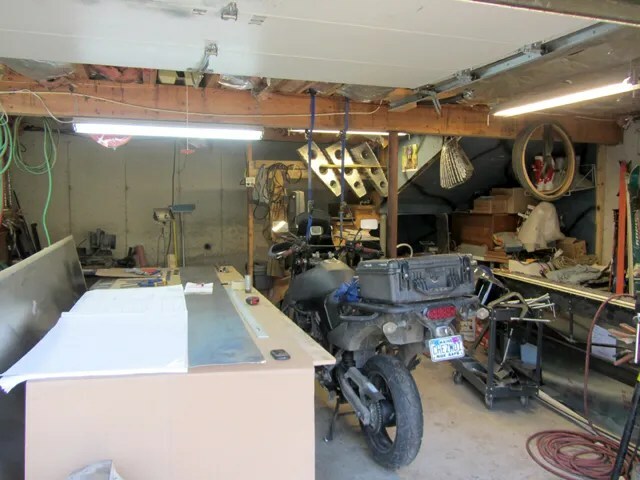 The space where I used to work, on my motorcycle, became occupied by a large workbench that, I needed, for cutting aircraft shapes out of, 4’ wide by 12’ long, aluminum sheets! 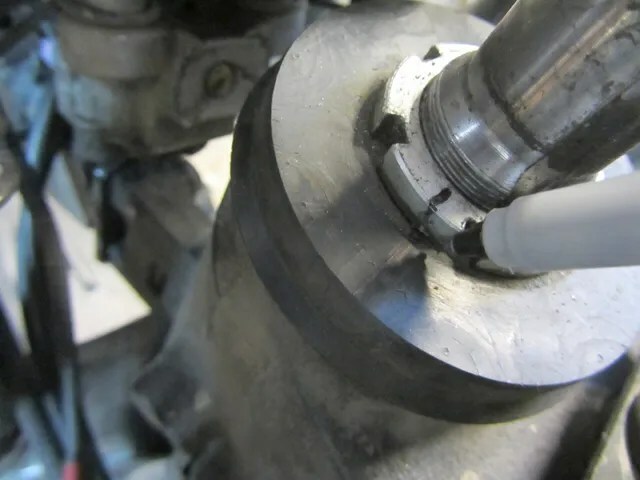 With regards to working on the steering stem bearings of my bike, I don’t follow what Suzuki describes in their Service Manual for preparation and, “proper” tensioning of the bearings. That is a choice that I made for myself, after experimenting with different bearing tension settings. 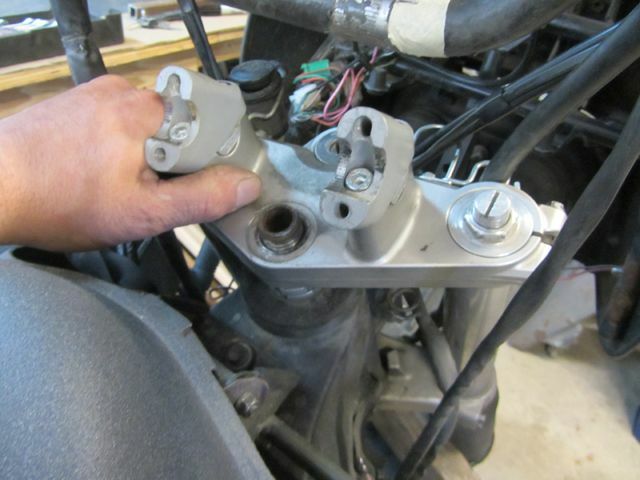 Besides, the Suzuki Service Manual was written for servicing OEM steering stem bearings. The bearings I installed in my motorcycle are tapered roller bearings. 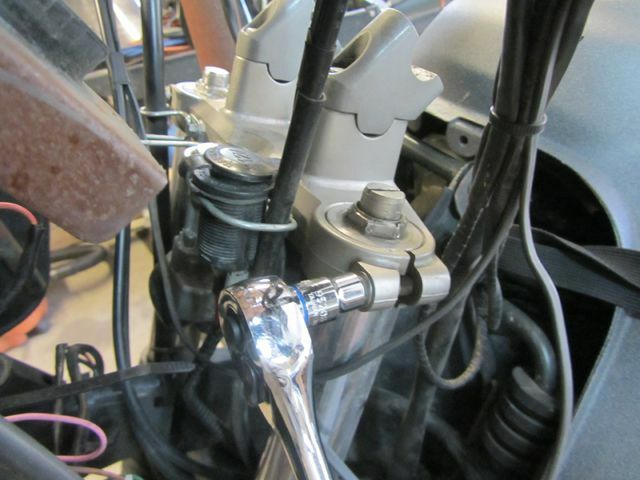 The preparation steps that I use to adjust the stem bearings, of my motorcycle, are fairly quick for me to follow. The complete job takes me about 20 minutes to do. I rolled my motorcycle into my garage, and placed it on its centerstand. The first thing that I did was to mark the location of my handlebars. It took me awhile to get my handlebars “just where I like them!” I don’t like spending time getting them back to that “perfect spot”, after I move them! I stuck a piece of masking tape on the handlebars. Using a “Sharpie” marker, I made matching “Sir Marks” on the handlebar risers, and on the masking tape. Now, I had a very quick way to reposition the handlebars back where they fit for me, when it was time to tighten them back down. 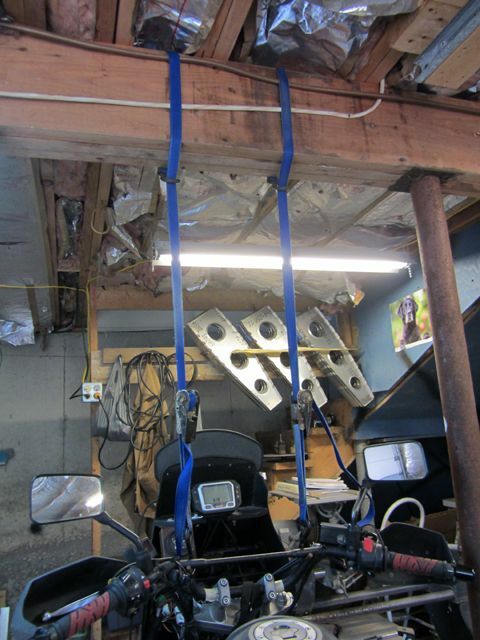 Next, I slipped two ratcheting tie-down straps over the supporting beam of the ceiling joists of my garage. I hooked one end of the straps around my handlebars, and the other end around the supporting beam. I added a little tension to each strap. I loosened and removed the handlebar riser caps. With the caps removed, I could “winch” the handlebar up into the air, and away from the top fork tube clamp. Then, I loosened the left and right, top fork tube clamp bolts. Next, I loosened and removed the stem cap nut and locking washer. I lifted the fork clamp up, and off of the fork tubes. I shoved it forward and out of the way. 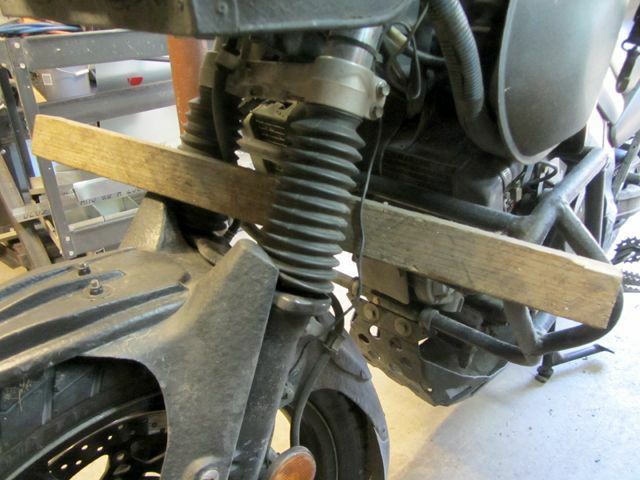 Then, I slipped a piece of 2” x 2” spruce between the fork tubes, and up against my crashbars. 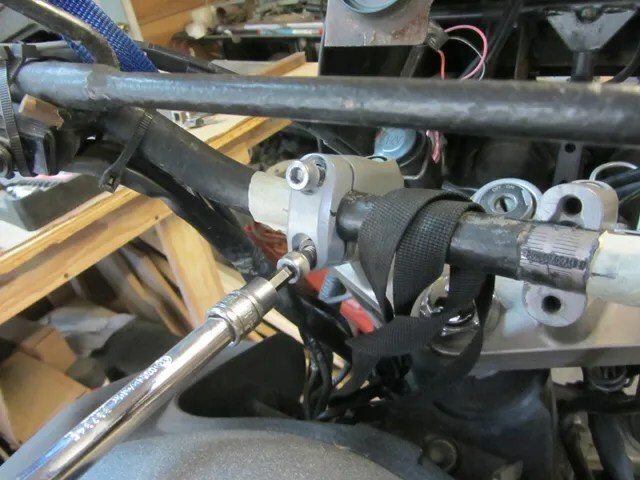 I did this to keep the front end from turning, while I removed the locking and tensioning nuts from the steering stem. Using the tool that I made when I installed the tapered roller bearings…..
……I removed the locking nut and washer. Next, I slid a floor jack underneath the skidplate, and raised the front wheel off of the floor. I made sure that the rear wheel was touching the ground, creating a three point “tripod effect”, between the two feet of the centerstand, and the rear tire touching the floor. To do my initial stem bearing test, I give the front forks a good shaking. With my hands, I pull forward and push backwards on the fork tubes to see if there is any looseness evident to the bearings. I do this with the front wheel directed forward and also to “full stop left”, and “full stop right”. There was some movement, which is what I had expected. Doing this test, also let me get a better feel for any “notchiness” in the bearings. If there was, it would be an indication that the bearings were worn, and needed to be replaced. At this point, I turned my attention to the stem bearing tensioning nut. Using my “Sharpie” again, I placed a “Sir Mark” on the nut; aligning the mark with the groove that has been machined into the steering stem. This mark, gives me an indication of where the bearing tension is currently set at. It is a mark that lets me know that the bearings are too loose at this tension setting. Then, I switched the piece of 2” x 2” spruce, through the fork tubes in the opposite direction, to “lock up” the front end of the bike. Next, I tightened the tensioning nut just as tight as I could; drawing the bearing races together. At this setting, I slowly swung the head of the bike, back and forth, to make sure that the bearings were “maxed out”. Then, I tightened the bearings again until I couldn’t move the tensioning nut anymore. In the photograph below, you can see just how little of a turn it takes, to “max out” the tension of the stem bearings. All it takes is about 1/3 of a turn to go from too loose, to too tight. A rough guide for me is, to tighten the tensioning nut to a position that is just a tad less then halfway between too loose, and too tight. I am favoring just a hair towards too loose. I will not know what the final tension setting is, until I go for a test ride. The photograph below illustrates where I chose my initial tension setting to be. At this point, I needed to button things up, and go for a test ride. To do this, I transferred the “Sir Mark” of the tensioning nut, down to the dust cover of the stem bearing race. 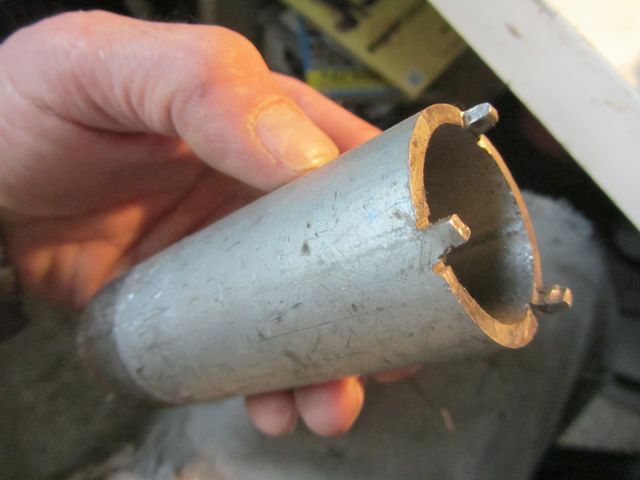 I did this so that, when I tightened down the locking nut, I could see if there was any movement of the tensioning nut. It doesn’t take much to change the setting and the performance characteristics of the bearings! 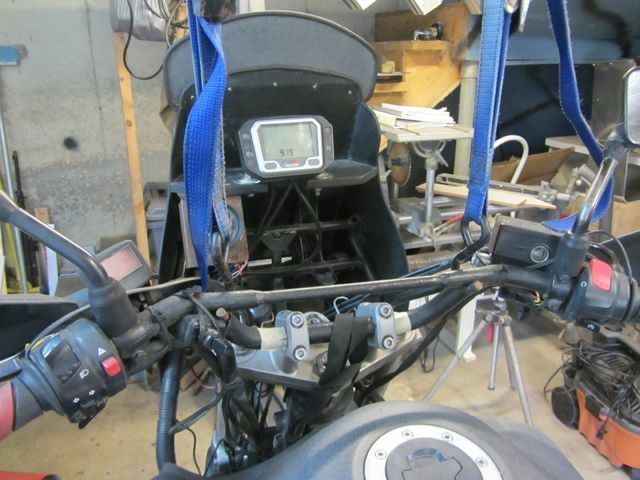 Then, I reassembled the rest of the motorcycle, so that I could go out for a test ride. When I went for my test ride, I was looking for several things. I put the bike “through its paces”, riding different roads of varying road surface conditions; some are smooth and some are rough. Very rough here in Maine, during the springtime thaw with resulting frost heaves and winter damage! 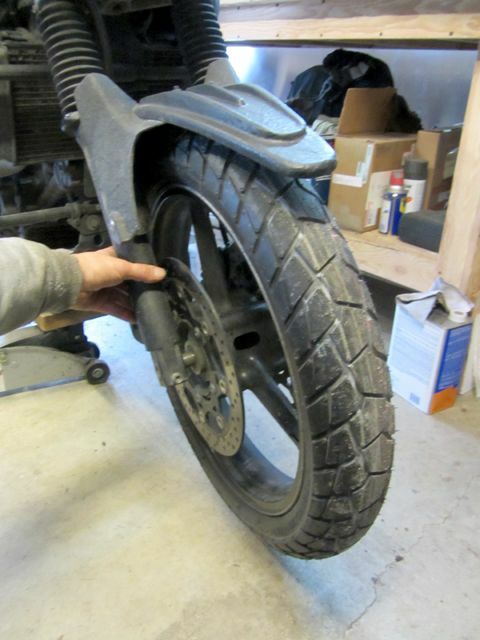 – The infamous “Deceleration Wobble”, (Other V-Strom riders mention this too. ), is gone. In the past, when the steering bearings of my bike were too loose, in certain situations, the front end of the bike would wobble. The wobble was not noticeable unless I removed my hands from the handlebars. With my hands on the handlebars, I could feel the wobble. If I removed my hands from the handlebars, the bars would visibly begin to wobble, increasing to a “tank slapper” situation if I didn’t place my hands back on to the handlebars! I can feel and test for “wobble” when decelerating for a traffic light, or to a stop sign. The “decel wobble” would appear at around a 30 – 35mph speed. – I found another symptom of loose steering stem bearings to be, what I call, “twitch”. Twitch happens when I am spiritedly riding rough surfaced roads. The feedback that I am receiving through the motorcycle’s handlebars is a slight left to right, “twitch”. The back end of my bike feels like it is behaving properly, but the front has a feeling of being “unsettled” and “uncertain” about what it is doing. 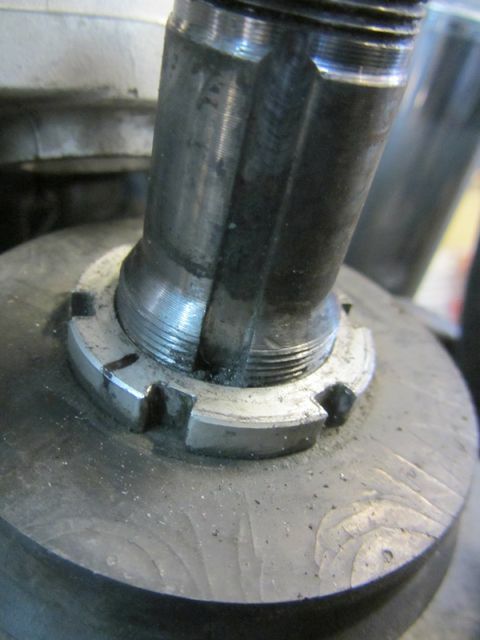 – Arm fatigue is another symptom of steering stem bearings being too loose or too tight. An example of arm fatigue from stem bearings being too loose is, if I am in a right hand “sweeper”, I find that I am constantly pushing forward with my right hand, on the right handlebar grip. I am literally “shoving” the head of the bike back up on to the line that I want the bike to follow through the turn. 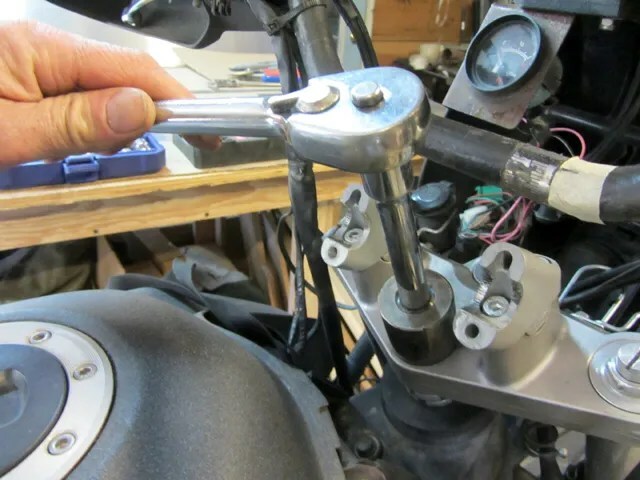 With loose steering stem bearings, the front end of my motorcycle will “fall into” turns too far. With my arms, I have to push the head of the bike back into position on the road. A day of riding like this, and I do feel it! If the steering stem bearings are too tight, the opposite effect takes place. While in a right hand sweeper, the bike will want to stand up. Now, my left arm is pushing on the left handlebar grip, to force the head of the bike back down to follow my line! Again, a day of riding like this can be tiresome! – The final bearing related “symptom” I look for is, “weave”. A weaving motorcycle happens at slower speeds, (In a deceleration phase), and is caused by stem bearings that are too tight. I found this happening to my motorcycle, during a test ride, after I had made a bearing adjustment with too much tension to it. As I decelerated from an “out of town” speed, to an “in town” speed limit, the front end of the bike “walked” left and right as I traveled in a straight line down the road. This happened in a 25mph speed zone. When I increased speed, the weave disappeared, but the steering of the bike felt “heavy”. I rode the bike back home, loosened the tension a “touch”, and all was good! All of the above symptoms have happened to me, while I experimented with different tension settings on the stem bearings. My bike has “twitched”, “wobbled” and “weaved”, (“Wove”?). And, my arms have been tired from either holding the bike up, or pushing it down! 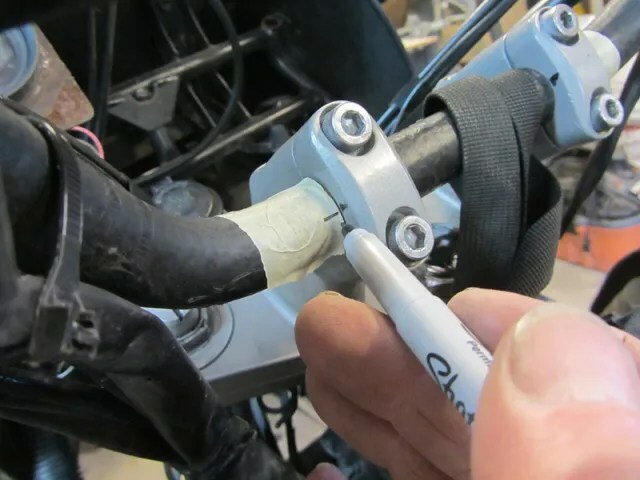 As I illustrated above, there is not much of a space difference between a stem bearing tensioning nut being set too tight, or too loose on my motorcycle. But, testing and retesting, what I need to do to eliminate bearing issue symptoms, and to have a great feeling ride, has been truly worth my efforts! Fortunately, my test ride for this year, fleshed out a perfect setup for me! No more adjustments for the start of the 2012 riding season! Thanks for the graphic write up! I like the idea of lifting the handlebars up out of the way, Don’t know why I never thought of that when bar removal is necessary. Trapperdog, thank you very much! And, thank you for taking the time to read the article. It’s been a slow slog, but eventually, my hope is to have 5 riding season’s worth of material, all organized in one place. Please stop back in the future! This is a great article which I have read and followed several times. I fitted taper rollers to my CB500F 2013 two years ago which improved steering immensely, but still not perfect. My CB650F 2014 with standard rollers has always steered perfectly. On fast right hand sweepers there is a very slight need to push on the right bar, but that may just be counter-steering. The bike feels good in fast sweepers . The main concern is what you call ‘weaving’. These two symptoms seem to be contradictory (one of too tight, the other of too loose). I have adjusted many times until I got them good, but would light to eliminate the weaving. Do you think I should I go for a little bit looser? My apologies to you, John! I was away on vacation when your post arrived in my “Inbox”. Then……it got buried under other e-mails. I am sorry about that! While doing “research” on these two phenomenon, I deliberately made the stem bearings too tight and also too loose. What I found for me is, “Weave” is a symptom of too tight, and “Wobble” is a symptom of too loose. So, to answer your question, yes I would back the tension off just a little bit. Thanks for the great work writing all of this up. I’ll be taking advantage of your techniques this weekend when I replace my bearings. I guess 78,000mi of “mild riding” (compared to you) is enough to do a set in. Hey Rob! Great to hear from you! I think that you will like this upgrade. Take your time, and think it through. This evening, I have packed up, and I am ready to roll for four days of riding through, New Brunswick, Nova Scotia, and Cape Breton. About 1,600 miles all totaled up. Make a run up to MDI soon! It would be great to see you again! i have only 25000 miles on clock but of recent have noticed a bit of a wobble at deceleration which appears from your article could be related to steering head bearings so come winter time to take a look eh!? Will be checking the stem bearing tension on my ’08 Wee this evening thanks to this excellent write-up. Thanks for making my world a better place! in several photos – I cannot see the edge of the tabbed washer between the upper and lower nut, where it is shown in the manual and logically should be. 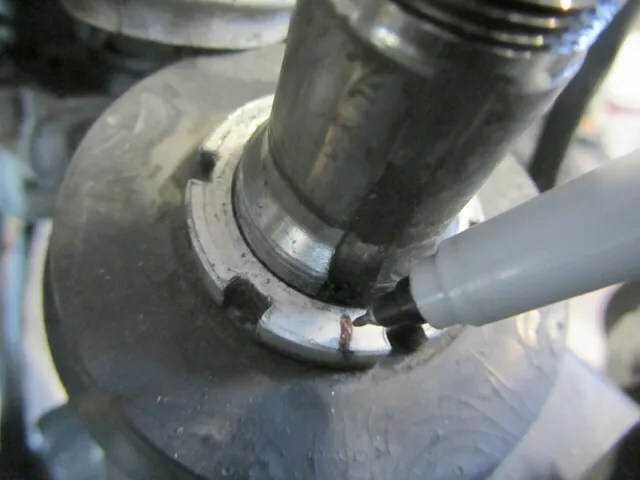 yes – the washer is clearly shown as a loose item – but in your photos of tightening and loosening nuts I would expect such a thick washer to be visible edge-on between the two nuts. Anyway – thanks for a superb photo documentation. 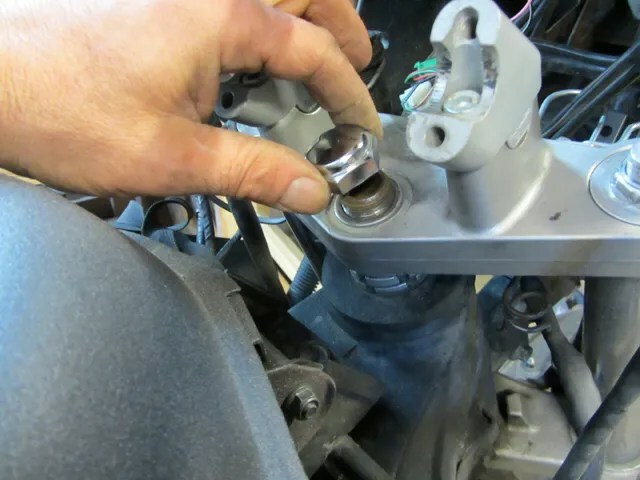 I have gone back to look at the photos, and most of the images are just showing the lower “tensioning nut”, so the “tabbed” washer and “locking” nut are omitted from the photo. Near the bottom, where I am tightening down the locking nut, I can just barely make out the “ghost” of the washer between the tensioning nut and the locking nut. Awesome tutorial! I was getting moderate low speed wobble after a new OEM front tire was installed. The dealership told me it was common in adventure/enduros and nothing was wrong. The wobble made it annoying to ride with only one hand at 35-45mph, I tightened the nut almost 3/4 turn tighter than before and it made a HUGE difference. The wobble is ever so slight with both hands off the bars, but unnoticeable during one handed riding. THANKS! Just fitted taper rollers to my new CB500F. After three adjustments of the standard bearings the steering was acceptable but not great. The new bearings already feel much better on the road, but I think I’ve got them too tight. Your comments on symptoms of too tight or too loose are just what I was looking for and could not have been written in a more understandable way. Thanks a lot ! I’ll let the tapers settle in for a 100 km or so, and if the symptoms persist I’ll slack them off just a little. With no centre stand and no safe spot under the motor to jack it up, the CB500F is a pig to get the front wheel off the ground. 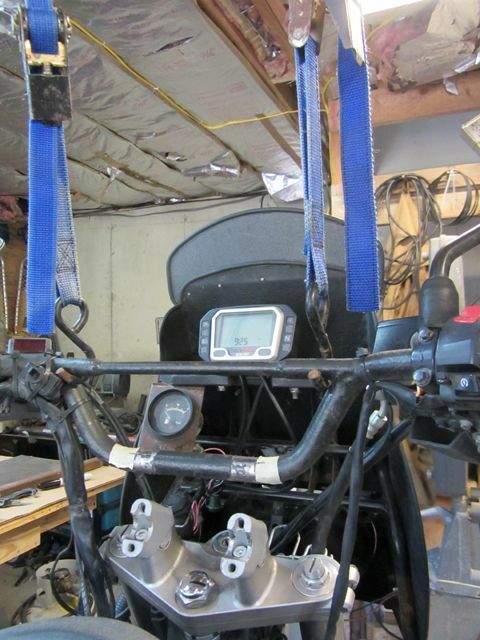 I ended up buying a 1.5 ton chain hoist, and used a 2 ton load nylon car towing strap to form a ‘sling’ around the two points where the front chassis bolts to the cylinder block. 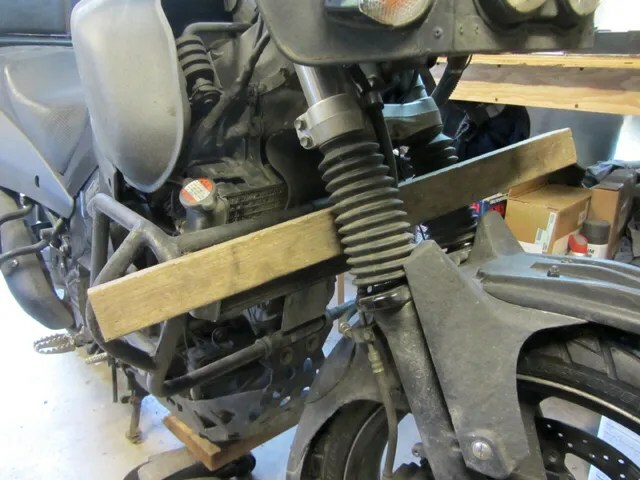 This works o.k but the clutch cable, electric cables and brake hose on the bars even when lifted out of the way do tend to offer resistance when trying to get the wheel to ‘flop’ to one side or the other. 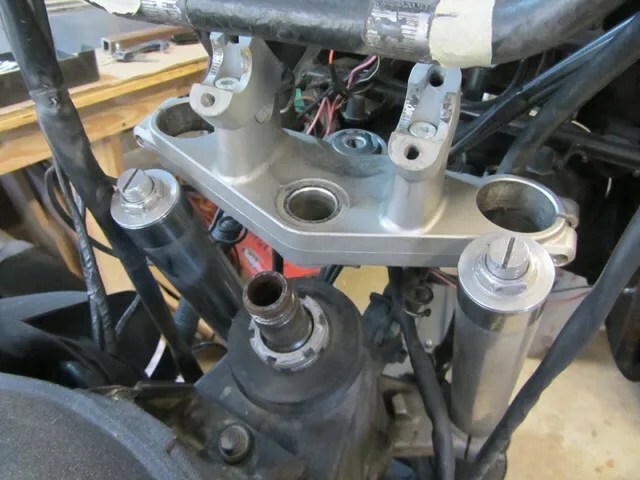 Finally got around to applying your article on bearing replacement and this one on adjustments this week! I really would’ve buggered the whole job if it wasn’t for your great write-ups. Thanks so much. You are welcome! Thank you for the compliment! Great write up! I had a really bad deceleration wobble, and after a bunch of adjustments, it was never solved. I went ahead and put in the all-balls taper bearings (great idea on using the mirror to verify the races are seated correctly) and now I have an interesting problem: the decel wobble is completely gone, but i have a bit of the high speed(65mph+) weave and higher effort which is an indicator of bearings too tight. I also have a bit of the low speed “hunting” and twitch (35-45mph) which is an indicator of bearings too loose. I’ve reached the point of running it with the tensioning nut finger tight + about 1/4 turn at most to get the best compromise in behavior. I know the tapered bearings use less torque than the factory, but this is REALLY light. 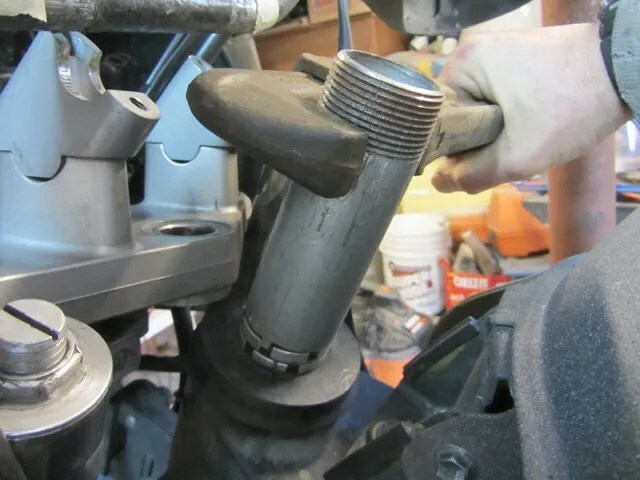 I shake the forks up and down while on the center stand while tightening the nut and stopping when the clicking goes away, then add in the ~ 1/4 turn. You allude to the bearings being very sensitive to adjustment and I agree. You seem to go to a really tight setting then back it off 1/3 turn and then go the middle. when i did that, the bike was really stiff and the high speed weave was unmanageable. Any thoughts on solving this apparent blend of too loose and too tight behavior? FYI, already ran about 1000 miles on the bearings, so they should be reasonably broken in. Thanks! Hello Joel, thank you for your post! It took quite a bit of “fiddling” (ie: “Trial and Error”) to come up with the process that I posted. The intention of my post is have it be a “jumping off spot” for other brave souls to experiment as well. Don’t get frustrated if you haven’t achieved the effect that you desire. Your comments about trying different settings tell me that you are patient and know what you will gain if you take the time to persist at the task at hand. My first “tightening” was to “set” the bearings; to squeeze them together tightly. Then, I backed the tension nut off until it was loose, and I swung the front wheel “left to right”, (literally grabbing the front wheel with my hands and aggressively “throwing” the wheel to the left and to the right.). After that, I tightened the bearings tight again, and made a note of where that tight spot was, (a Magic Marker works well for this. Place a “sir mark” on the nut and correspondingly on the stem area.). Then, I loosened the nut and made a note of where that mark was. From there, I had a visual reference as to what too loose was, and what too tight was. I started with a halfway point and adjusted from there. If I remember correctly, I backed the tension nut off a bit from the halfway mark. Having said all of the above……. I gave the “Black Beast” away in 2012 and I began riding an old 1993 KLR 650 that I completely took apart, (Yes, every nut, bolt, washer; including splitting the crankcase etc! ), and I have been riding that. Because I did even more work on the KLR than I ever did on my DL-650, sometimes a “mental fog” overlaps the two machines and end up in a: “Wait, was that on the DL-650, or the KLR?” kind of a moment! In 2013, I rode the KLR solo across Labrador and Newfoundland and back to my home in Maine. Largely since that near perfectly executed trip, I have been working on restoring the old wooden sailboat I bought last year (2014), and I am not riding much anymore! Good Luck and keep at it! You will love the “on the rails” feeling once you get the stem bearings, front suspension and rear suspension all dialed in. It is an amazing feeling of being really “stuck to the road”! Joel K, that’s a pretty weird case, given that you’ve put new races and bearings. i have the simillar thing (both sort of problems, ie decel. wobble on 60km/h and low speed weave, it’s on yamaha xtz750), but we didn’t swap bearings, my nephew mistakenly touched the steering stem nut (tried to tighten it) instead of the upper bolt that was too loose and made some “kloink” noise on smaller obstacles on the road (xtz doesn’t have this double nut system that dl650 has, it has “main” nut under the triple tree, and one more on top of it). did breaking it in further solve your issues? in any case that’s the most sensitive nut to adjust on the whole bike, i would say. Ivo, since then, the low speed hunt/twitch has disappeared, while the high speed weave has gotten less and less. i attribute it to two things: Bearings breaking in and the grease thinning, and my tires wearing in quite a bit. I run the Continental road attacks on the bike (it’s what it came with), and if you look online you’ll see that the reviews are very mixed on their stability. i’m going to put new tires on in the next 1-2 months, and if the handling changes i’ll post up here and let people know. Four types of steering head bearings in widespread use. 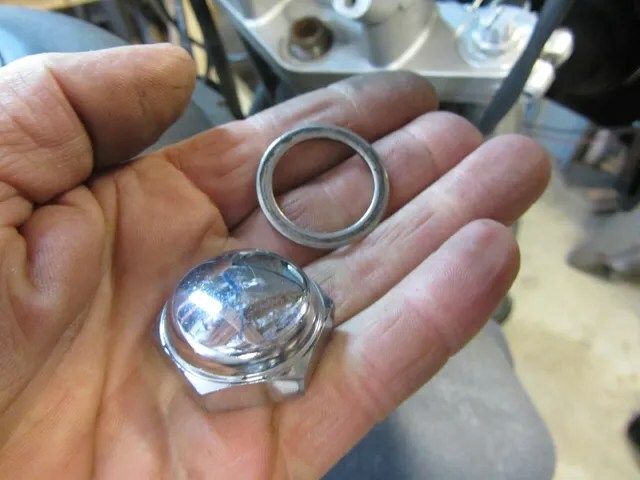 With some exceptions, motorcycles built prior to 1979 will generally have loose ball-type bearings, while the bikes built after that generally use caged ball, sealed ball, or tapered roller bearings. Nice article and explanation of tightness (or not) symptoms. 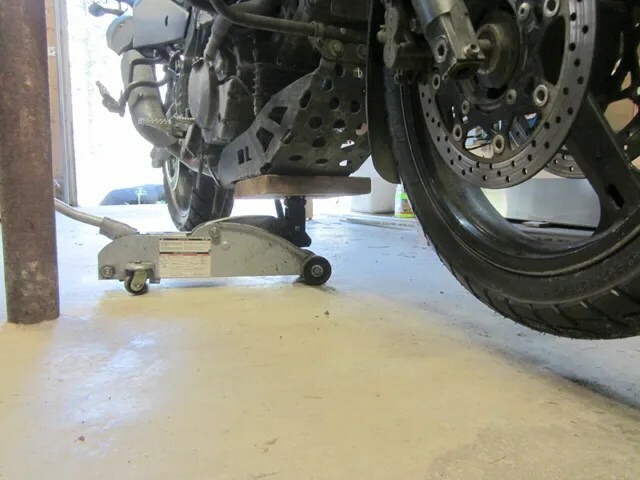 Experimenting with tightness settings on a BMW F800GT (tapered rollers) atm and being over tight makes steering and cornering at low speeds problematic in that the front wheel wants to run wide and corners are taken in a series of wobbles. As i back off the pre-load, the front wheel seems to steer a much tighter line and goes though the corner in one arc. My local BMW service manager says the best (only?) method is is to set pre-load by feel. Fortunately i only have to back off the top triple clamp bolts and the triple clamp head stem bolt (bars & triple clamp stay in place and back the head stem bolt off a tad. Takes about 5 minutes all up. loosening included lifting front end of the bike, loosening top fork tube clamp bolts and removing the upper triple tree to reach the bolt(s)? Yes. However, because I was at the last bit of “tweaking”, I did not lift the front wheel off of the ground. You do have to remove the upper triple tree to get at the stem nut. Joel K, in my experience crappy/worn tires affect the handling but in a different way, for example on my bike dunlop trailmax felt like it was sliding out of the cruve, and that’s probably because it indeed was, because it had a weird wear pattern where middle of the tire wore more than sides or center portion. tire didn’t have bumps and wheel was balanced. other symptoms of worn tires are the bike “lay” into bend, also poor tracking of indented lines on tarmac(esp. rear wheel) etc. as for adjusting steering nut i had better luck with adjusting it with the front wheel on the ground, but keeping the bike upright (not on the sidestand).